LinguaForum Hooked on TOEFL Listening (New Edition) is the revised version of Hooked on TOEFL Listening Cram/Crash Course series. It is intended for advanced students preparing for the TOEFL iBT and is based on the most up-to-date information on the test. A more focused question-type analysis and test-taking strategies section to provide students with key information about the TOEFL Listening section as well as practical strategies to approach each question type in order to maximize their performance on the test. Updated topics and content based on through analyses of real test materials that have been administered most recently. 15 mini tests to challenge students to apply test-taking strategies and build skill retention. 2 actual tests to familiarize students with TOEFL iBT format and timing. An answer key that provides answers with TOEFL iBT format and timing. An answer key that provides answers to all practice exercises and tests. To many students, preparing for the TOEFL iBT Listening section can be a formidable and frustrating experience due to the new format and unfamiliar question types. They need a guide to approach the tasks which are specific to this new test and to focus on their studies. 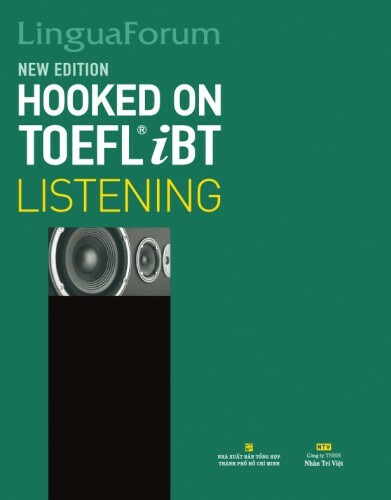 LinguaForum Hooked on TOEFL Listening (New Edition) was designed to meet those needs. Based on thorough research and careful analyses of real test materials, the book is an efficient way to help you earn the highest scores possible.